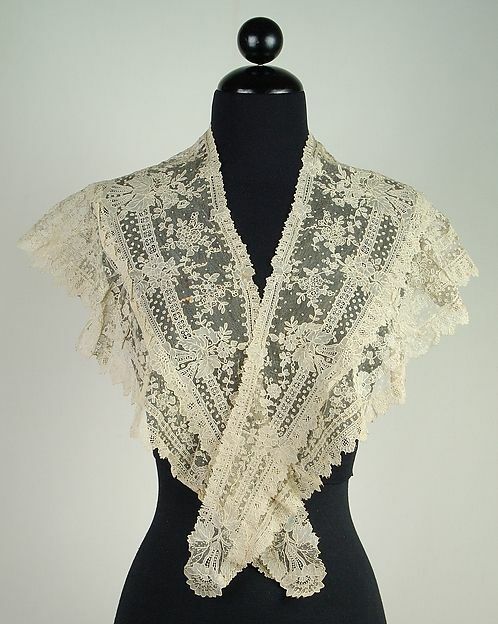 A Victorian fichu was a gauzy, frilly, large collar or small shawl and was a carry-over from the 18th century. The word seems to have begun as a French term for a 'carelessly thrown on' neckerchief. Eventually it also became popular in England, the United States, and elsewhere. Nineteenth century fichus became more elegant and changed shape from those of the 18th century. 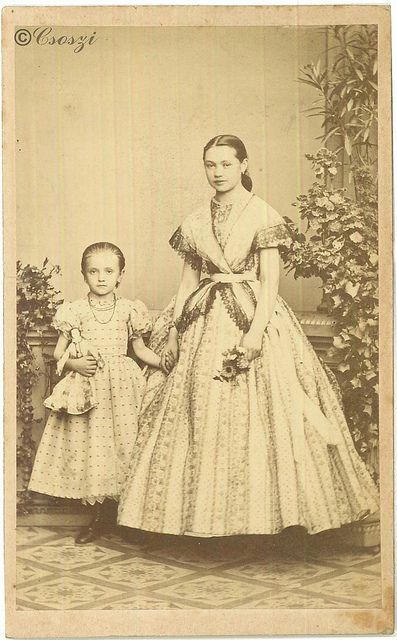 In the Victorian era they were a suitable accessory for day wear as well as evening wear. 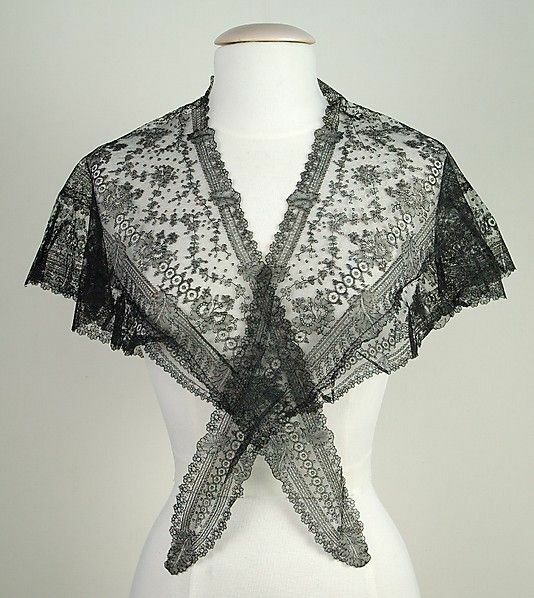 They varied in shape and style from a small lacey confection to a longer, more dramatic fashion statement. Following are a few quotes from Godey’s and Peterson’s, leading ladies magazines of the day. 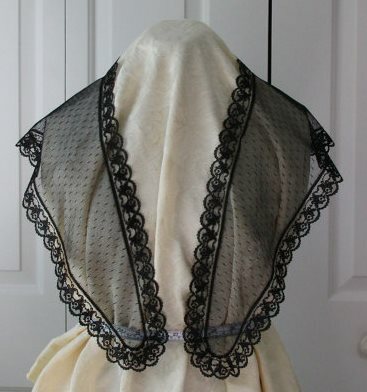 This fichu is intended for an evening or a dinner toilet and makes an admirable finish to a dress, besides obviating the necessity of having any further trimming on the bodice. The fichu forms a kind of bodice, open in front, and with two long ends before and behind. It may be made in any bright-colored silk, and is covered with white tulle or net, put plain over the silk, with the exception of the back, which is arranged in five puffings from the waist. The fichus is trimmed round with a narrow black lace, and a wide white lace or blonde, divided by a narrow row of velvet. 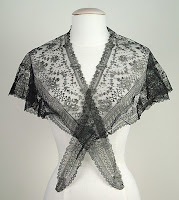 It is further ornamented with black lace leaves applied on the net or tulle. These leaves can be purchased separately, or they may be cut out from old pieces of black lace, the foundation of which is worn out. The dress has a trimming at the bottom to correspond. Our fifth engraving is a fichu, trimmed in purple or blue, as the wearer’s taste may dictate. 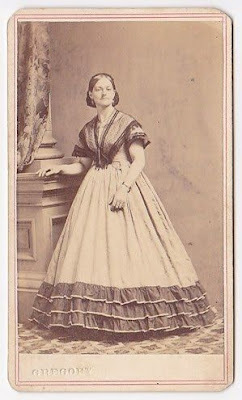 For dinner or evening dresses, low bodies are very generally worn with a cape or fichu in black and white lace or guipure. 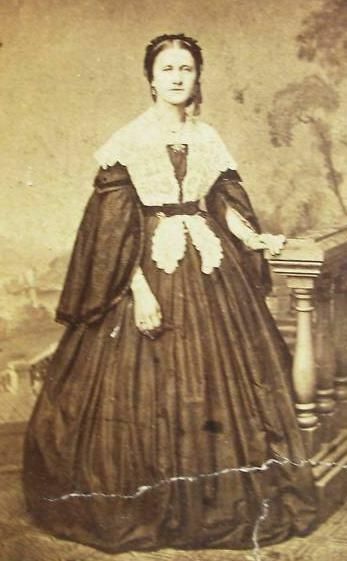 For young ladies, silk dresses are often made with a low body, and a small squared shaped cape of the same material to wear over it, the body is then high, and if wished to be worn low, the silk cape is replaced by a tulle fichu, so that the dress is equally appropriate for walking or evening attire. Fichu for summer wear, suited to dinner or evening dress, it is quite as graceful and a newer shape than the favorite Marie Antoinette. The bows may be either of black velvet, or a shade of satin ribbon harmonizing with the dress. 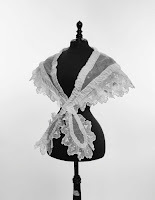 Fichu for a low corsage or evening wear. It is of black lace over white; the medallions and ruche being of ribbon. Two rows of good black lace surround it. The Antionette fichu, with ends crossing either behind or before, is also very much worn with muslin, barege or jaconet dresses. This fichu supplies the place of a high body, and makes, with spencers, a variety in the toilet. It is composed of white muslins, sometimes of either black or white lace. 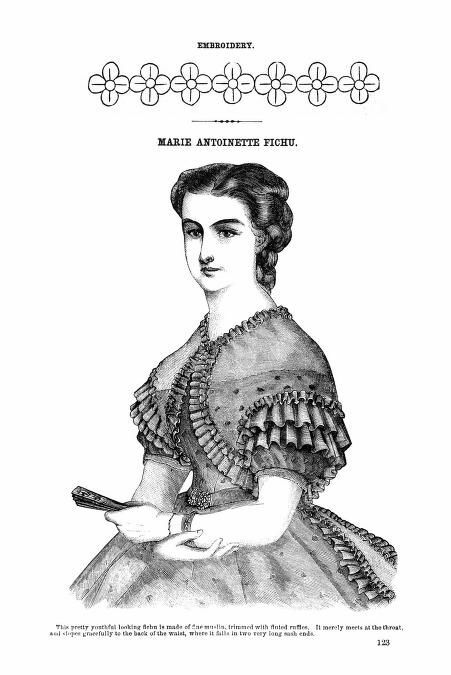 Besides the white waists, which are worn with low-neck bodies, there are numerous styles of fichus made of muslin, tulle, or lace, and trimmed with ruches, velvets, and bows of ribbon….Many of the fichus cross on the breast, and terminate in long, rounded ends trimmed with velvet, or in pointed ends which fasten underneath the sash or waistband. I have a lovely original fichu in my collection and I decided to offer fichus in my shop based on it! Below is one of my creations designed from the original.